Trevor Leo was a star player and leader at Hobart, New Norfolk and for Tasmania during what is often described as Tasmanian football’s ‘golden era’ in the 1950s and 1960s. He commenced at Cooee on the north-west coast in 1953 and also had a season with Launceston in the 1960s. Rover Trevor Leo came to Hobart from Cooee where he was a club best and fairest winner in his first season of senior football. He made his Hobart debut in 1954 and was a member of their premiership side that year as well as in 1959 and 1960. 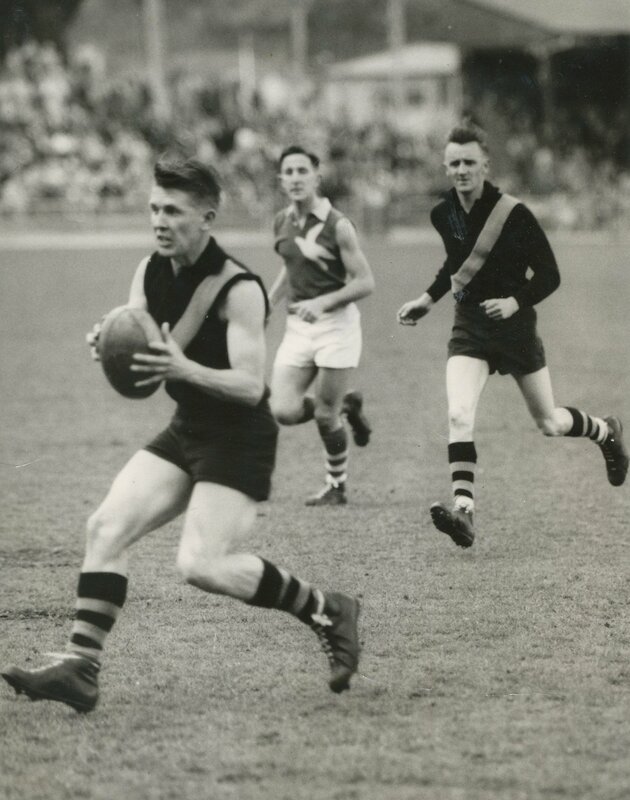 His greatest individual achievement as a player was winning the Tasmanian Football League’s best and fairest award (William Leitch Medal) in 1957 and he also won two club best and fairest awards with the Tigers. Trevor Leo was an educator and spent the 1962 season with Launceston in the NTFA before returning south to become the captain-coach of New Norfolk in 1963. The New Norfolk Eagles had not enjoyed premiership success in the TFL since their inclusion after World War Two when the competition moved to ‘district football’. With Leo guiding the club on the field and President Les Hepper leading the off-field work the Eagles entered an era characterised by finals heartbreak and, ultimately, statewide football success. In 1963 Leo took the young Eagles, including a 17-year-old named Peter Hudson, to a top two finish. However, they were bundled out in both their finals games against the more experienced teams of Sandy Bay and then Hobart, who defeated the Eagles in the preliminary final by a solitary point. The following season, 1964, the Eagles led the competition and won the second semi final, but were unable to repeat the feat against Sandy Bay in the grand final which was played before a record crowd of more than 20,000 people. The 1965 season saw another top two finish and heartbreaking losses in the second semi final to Glenorchy and this time North Hobart in the preliminary final, once again by a solitary point. The 1966 season followed the pattern established in 1963 and 1965, with the team finishing top two, only to succumb in the finals series. The 1967 campaign commenced with the transfer of Peter Hudson for his long awaited VFL debut with Hawthorn. This season the Eagles were bundled out in the first semi final and the premiership window for the talented Eagles of the 1960s appeared to be closing. However, in a fascinating 1968 season, the Eagles finished the roster on top and hopes were again elevated, though reality struck when they came up against the reigning premiers, North Hobart, in the second semi final and were defeated by 53 points. Following this reality check, Trevor Leo steeled the Eagles and they carried all before them in defeating Clarence in the preliminary final and then North Hobart comfortably in the TFL grand final for their long awaited first TFL title. To add icing to the cake, they defeated Scottsdale in the state grand final to take out the title of Tasmanian football premiers for 1968. This would be Trevor Leo’s final game as a player. The 1969 season would prove to be Leo’s final season in charge of the Eagles and they once again contested the finals series but had to settle for a semi final win and a preliminary final loss. In all, Trevor Leo led the New Norfolk Eagles in the TFL for seven seasons and seven finals series. The Eagles played 15 finals games, including the 1968 state grand final, under Trevor Leo for five hard-won victories, but none were sweeter than the triumphs which delivered the title ‘New Norfolk: best football team in Tasmania’. Trevor Leo is credited with more than 250 senior games for Cooee (1953), Hobart (1954-61), Launceston (1962) and New Norfolk (1963-68), and intrastate and state representative games. On 18 occasions during his career he represented Tasmania in interstate football, including the 1956, 1958 and 1961 Australian National Carnivals. He was also Tasmania’s coach at the Australian National Carnivals in 1966 (Hobart) and 1969 (Adelaide). He retired as a player following his 1968 triumphs with New Norfolk but stayed on as coach for one more year in 1969. In 1974 he returned to Hobart where he was coach for the season.